The western genre has enjoyed a rejuvenation, a renaissance of sorts, over the past decade, but it's reached a point where new entries either need to possess something truly distinctive or get the weathered, lawless atmosphere just right to leave the impression that it's worth pursuing. As of late, entirely competent and sufficiently entertaining westerns that don't really go that extra mile -- even one or two that do -- get left in the dust as a result, often abandoned in the outskirts of the direct-to-video landscape despite varying degrees of star power. In a Valley of Violence is (essentially) one of those, an entirely functional but unexceptional tale of revenge from the horror-fueled mind of writer/director Ti West. While there's some emotional rawness, levity, and consistent performance value from Ethan Hawke and, especially, John Travolta here, the film's humdrum atmosphere and resemblances to another tale of canine revenge make it more forgettable and throwaway than it could've been. In a Valley of Violence sets its sights on a lone wanderer, Paul (Ethan Hawke), who's hoping to reach Mexico and leave his prior life behind him. After encountering a loutish priest (Burn Gormon) who points him in the direction of a nearby town, the wanderer -- alongside his dog, Abby -- takes a pit-stop in the sleepy, near-empty settlement of Denton, colloquially named the "Valley of Violence". The treatment he receives as a stranger is predictable considering the genre: a scuffle at the local bar lands him in a conflict with one of the town's strong-arms, Gilly (James Ransone), putting a target on his back as he tries to shack up at the hotel, curated by sisters Ellen (Karen Gillan) and Mary-Anne (Taissa Farmiga). Paul has sworn never to kill anyone again, but after a senseless act of violence, he chooses to break that oath and exact revenge on the town's bullies. He meets resistance along the way, notably the law-abiding posturing of the local marshal (John Travolta), but little keeps him from pulling the trigger once he gets roped back in. Best known for his work in moody, immersive horror, especially that of The House of the Devil's well-executed ‘70s-style throwbacks, the wild-west attitude of In a Valley of Violence seems like a bizarre but promising vessel for director Ti West's talents. Turns out, West's grasp on mounting tension heightens the predictable moments of intimidation in puffy-chested posturing and square-offs, sporadically highlighting the danger that follows Paul on his trek through the dusty town. There's another side of In a Valley of Violence, however, that wasn't so expected: he incorporates a fair amount of humor around the dreary subject matter, to a point where the brutish threats and gang-like cronyism in Denton comes close to parodying the western, yet not comedic enough to play as one. Some of that falls on the language of West's script and the performances delivering it, which have more of a contemporary slant to them that, despite some amusement value, takes away from the consistency of the atmosphere, especially with Ethan Hawke's sincere but decidedly modern attitude at the drifter Paul. 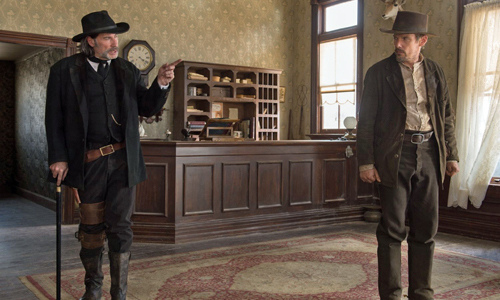 Based purely on those virtues, In a Valley of Violence struggles with a tricky mixture of clashing moods and meandering objectives, and that's before the film's true purpose kicks into gear. A few mild spoilers follow. West takes the film on a detour down a dark and emotionally manipulative path involving petty vengeance, past demons, and violent retribution, blatantly echoing the framework of a breakaway action hit from a few years back, John Wick. Both revolve around a "retired" professional killer who's forced back into the game by the brash actions of an arrogant son of an important person in the city, and yes, animal lovers should proceed with caution. Granted, there's some variation in the moral complexity going on in the characters, especially involving the town's marshal, given surprising texture by a stubbly John Travolta, whose evenhanded desire to keep the peace in his domain and respect the integrity of both men involved in this inconsequential conflict almost saves the day. Director West and his horror inclinations push too hard in the wrong areas to differentiate his spin on the tale, though. Perhaps some of In a Valley of Violence's missteps could've been pardoned had the anticipated shootouts and vengeful finale grasped enough visceral suspense, which isn't unexpected when one considers the trajectory of West's previous features. After a few head-scratcher decisions from the characters that unnaturally contrive the circumstances of the final act, the grand "shootout" that results regrettably lacks focus and intensity, though. Despite a few flashes of inventive cinematography and deeper emotional connections between the characters, the result is an awkwardly-paced skirmish through the town that pulls punches with the antihero's vengeance and interrupts the momentum with odd diversions, ones that involve domestic squabbles and, I kid you not, a message against body-shaming. Inspired motivations can be found in West's mildly idiosyncratic pursuits, but he ultimately loses touch in following through with the film's central and anticipated culmination, neglecting to keep the mood firmly planted on the saddle during his not-so-violent gallop through the wild west.